A certain amount of body fat is essential to bodily functions. It regulates core temperature, cushions and insulates organs and tissues and is the main form of the body's energy storage. Essential body fat is necessary to maintain life and reproductive functions. 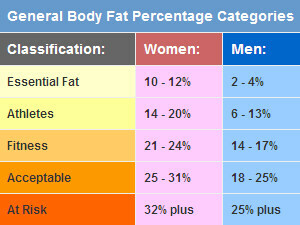 Essential fat is 3%–5% in men, and 8–12% in women. Some regard the body fat percentage as the better measure of an individual's fitness level, as it is the only body measurement which directly calculates the particular individual's body composition without regard to the individual's height or weight. Since the majority of fat is located directly under the skin, a very efficient and practical way to measure your BF percentage is skin fold measurements. Calipers specifically designed for for skin fold measurements are the only equipment needed for this type of assessment. So whether you choose to use the the calipers privately or with the help of someone else, just follow the simple steps in the video below. A proper diet, and regular exercise is a great way to manage your body composition. Very simply, if you are consuming more calories than your body needs, most often these calories will be stored as a fat. Become a label reader, this will help you control and monitor your fat intake. Remember 1 gram of fat = 9 calories.